Accommodation in high quality hotels/lodges which offer more comfort during the treks. Our Annapurna Comfort-Lodge-Trek has been designed for those who want to come incredibly close to the huge giants of the Himalayas in a more comfortable way. The differences in height, unusual geography, and pleasant climate make trekking in the Annapurna area the dream of every true nature, comfort, and mountain enthusiast. 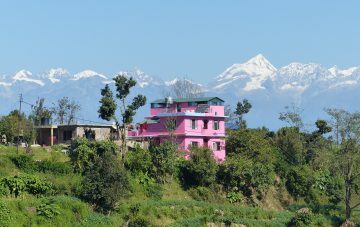 The low lying mountain scenery around the Kathmandu valley offers a great opportunity for a short trek in Nepal. On this relatively easy tour you will get a first glimpse into the magical high mountains of the Nepal Himalayas (Manaslu, Annapurna, Everest and Numbur) and experience its nature, culture and people at first hand. Following in the footsteps of world-famous mountaineers, you will get close to the world’s highest mountain – Mount Everest (8.848m) – close enough to touch. This is the shortest route to Everest base camp, which is the most famous trekking tour in the world due to its beauty, its grandeur, and its history. During this tour you will spend the nights in lodges with attached bathroom in the Nepalese Khumbu region. The lodges offer a better standard of accommodation than is otherwise available in the area.